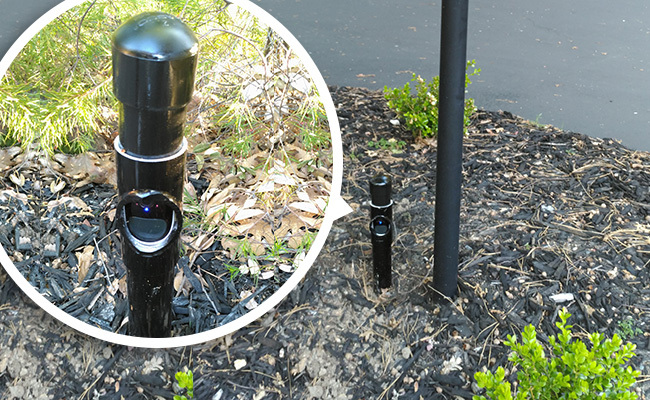 Want to hide security cameras in plain sight creatively without anyone’s notice? Today you will learn how to hide security cameras outdoors, indoors, in a window, etc. (with pictures and videos), get bonus tips on hiding security camera wires and the DVR/NVR, and find the best hidden security cameras for outdoors and home. WiFi hidden security cameras for home are more effective in finding out what your nanny is really doing and gathering clues to confirm your suspicions. And many households are using both obvious and hidden security cameras: The security cameras in plain sight are used as deterrent, and the spy security cameras are hidden nearby to capture the whole thing if the obvious ones are spotted and disabled. Moreover, you will have no legal issues with hidden security cameras in the neighborhood. (Click here for more information). Actually, the best way to hide security cameras outside and inside is to get a spy or small security camera directly. It’s definitely much easier to hide a security camera if it is small with no wire at all. And the mini battery powered security camera is an ideal model to hide. They are highly portable so you are free to hide the security camera anywhere outdoors and indoors to watch your front door, driveway, garage, porch or garden. For example, a user of Reolink battery security cameras shows us how to hide the camera with a PVC pipe to watch the front door for him. This tiny wireless hidden camera with audio and night vision just blends in with the material seamlessly. Extra tip: Whatever you do, try not to waste your best positioning for good images. In my opinion, hiding security camera isn’t worth having to give up resolution of your car/front door/etc. 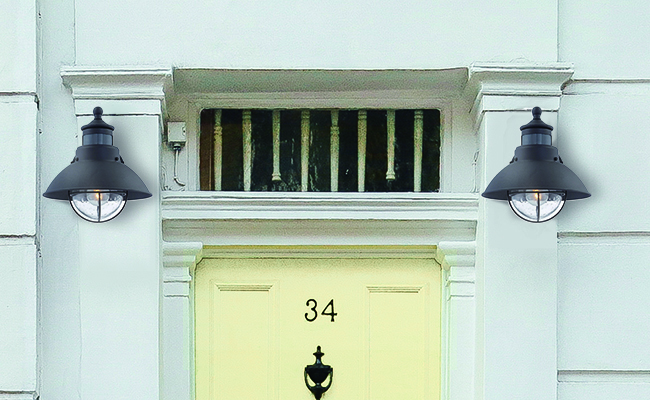 You may find many hidden security cameras out there designed into exterior lamps, alarm clocks or charge adapters, which needs you no extra effort to hide them. But attention, those CCTV cameras may disappoint you in their images and features. For example, the outdoor light with motion activated camera mostly provides blurry 720p images with limited night vision, which is impossible to figure out the facial details or plate number when needed. So if you are expecting hidden security cameras with higher resolution (1080p and above) night vision, Wi-Fi connection, audio, app, etc., a battery powered security camera is the way to go. 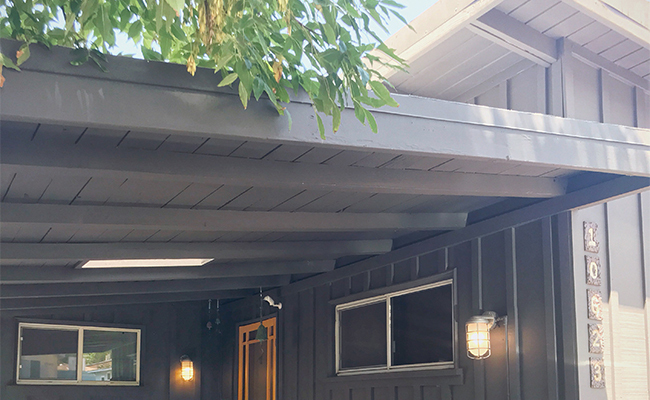 Most mini cameras are practically invisible if they are mounted under the eaves. Since the camera is small and the body cover is white, unless you really look for it, you will not see it. The hidden camera on a house from the street, like the Reolink Argus 2, is pretty small, really. No one looks that closely. The smaller size of the security cameras, the easier it is to hide. 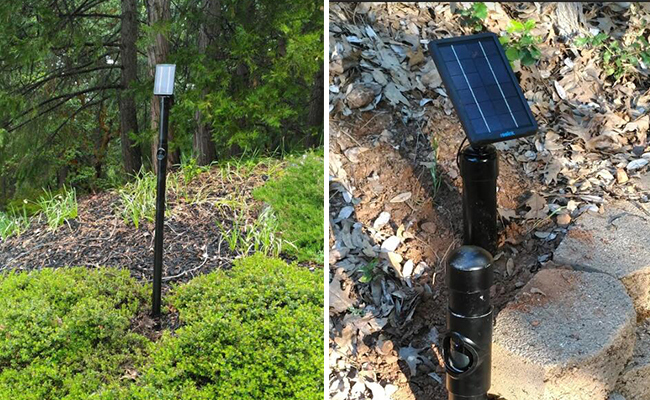 Here the Reolink Argus 2 user just leave it under the eaves and hardly anyone could notice from a distance. You may also dress the camera with a black skin to make it more inconspicuous. Extra tip: Install the security camera on a weekday if you can, when everyone else is at work. That way they aren’t watching you hide the security camera like they would if it was a weekend. If you can get them in place without attracting too much attention, no one will really know. 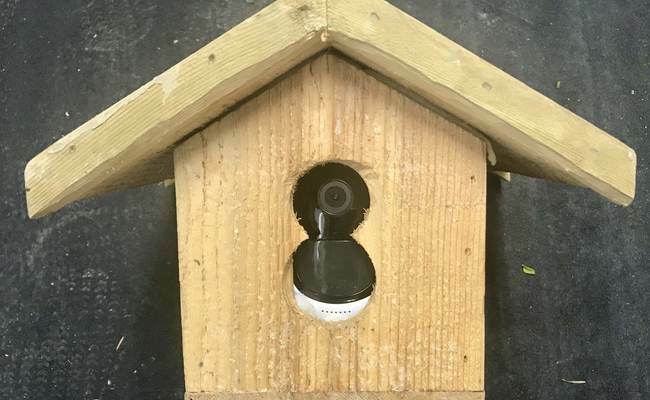 The traditional bird house is a good place to hide security cameras. The enclosed style with just a small hole in the front allows the camera to capture videos outside and offers a level of security for vandalism at the same time. Note that this image has been cropped and the viewing angle of this hidden security camera could reach 130° diagonally in fact. Note: Make sure there are no obstacles blocking the cameras’ view so that the exterior hidden security camera could capture what you want. Could hardly spot the Reolink Argus 2 and the solar panel (it is disguised as the top cover!) at the first sight, right? 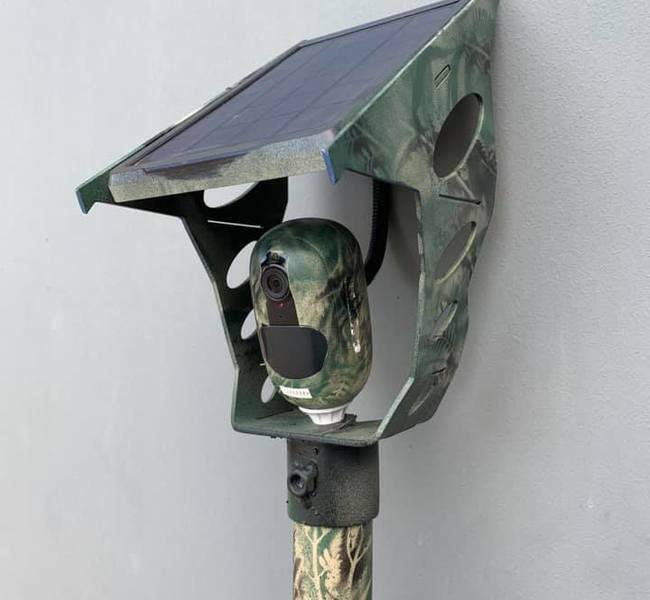 Or you may learn from the Reolink RLC-423 user who paint the camera with camouflaged color and use it as a hunting camera. How to hide security camera outside? 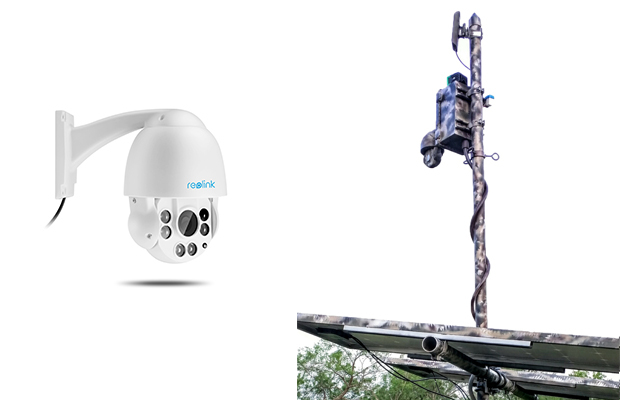 The video shows us how to build and hide the trail surveillance with Reolink cameras, how to run the wires, and how to monitor them through software. A good idea is to paint the mini white camera brown to make the camera more fit in with the environment. Extra tip: If you find the wiring difficult for you, just turn to the battery wireless hidden camera instead, with no wires and camouflage skins to make it hidden easily. This windowsill is rather covert to hide a home security camera. Even if the camera is spotted by burglars, it is hard to be disabled – at least it takes time to do so. When burglars finally get the camera, the footage and images will have been sent to your devices already. Extra tip: Attention that using a hidden security camera for home to record through windows may affect the night vision and motion detection. I will explain how to correctly hide security cameras in a window in details (Click here to jump to that part). Extra tip: It is advised to have more than one camera in place and set up a hidden security camera system. How to hide security cameras? The mini spy camera Reolink Argus 2 provides you with various possibilities. For example, you may hide it indoors in plain sight among toys, in the plant pot, in the book shelf, or hide it outdoors in the bushes with camouflage skins. How to hide a security camera in plain sight? 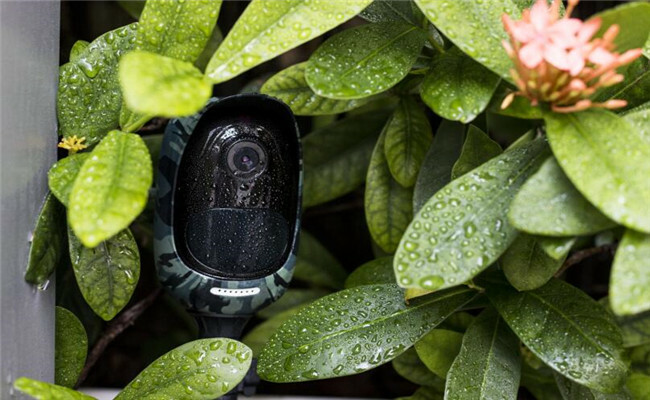 Camouflage skins are the best tool to help you hide security cameras even in plain sight: Just dress them with a suitable skin to make it blend in its surroundings. For example, when you want a wireless hidden security camera for front door, just dress the camera with the white skin and place it under the eaves or ceilings. You are also free to change its skin with the black or camouflage one to make it blend into the environment. Only a really discerning eye would recognize it. Have more questions about how to creatively make your own hidden security camera? Read the FAQs to get more insights into hiding your security cameras. #1. Where to place your home hidden security camera? The statistic shows that over 34% of burglars enter through the front door, and other notable locations include first-floor window (23%), back doors (22%), and garages (9%). And therefore, it should be your priority to place hidden security cameras on those spots. Read this to get more ideas about where to place home security cameras. #2. How to hide security camera wires outside? The best way for hidden security camera wires arrangement is to get a wire-free hidden camera, which has no cables at all. And that will save your time. If your spy security camera does have wires, follow this detailed guide for running camera wires (BNC/power/Ethernet cables). #3. How to hide a security camera in a window? As I mentioned above, if you place the security camera behind a window, you will have to compromise in its motion detection (for cameras with PIR motion sensor) and night vision function. To solve these problems, you need to get a security camera with software-based motion detection for accurate alerts and install external infrared illuminators or visible light for night vision. What to do to successfully hide the camera in window exactly? Read these bonus tips of using security cameras through a glass window. #4. How to hide the DVR/NVR of your hidden camera? There are several sneaky places to hide a security camera DVR/NVR including the attic, inside the walls, the closet, the bookshelf, the possible crawlspace, etc. You may also use a DVR/NVR locker if necessary. And remember, most of the NVRs or DVRs on the market are not waterproof so you need to avoid the rain or other pouring water when you hide them outside. Find more tips to prevent DVR/NVR from being stolen here. #5. Is it legal to hide security cameras or use a hidden security camera? Generally speaking, you can record videos with a hidden camera for both home and outdoors. But do not record in areas where people have a reasonable expectation of privacy, like the bathroom. 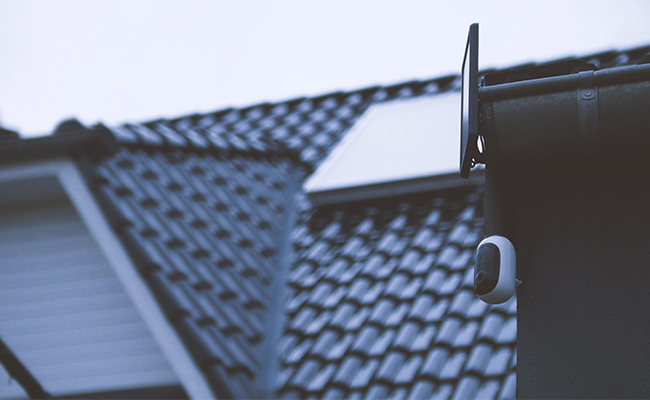 Before you hide a security camera, it’s advised to speak to an attorney about the specific ways you plan to use the camera and the locations you’d like it to be installed. 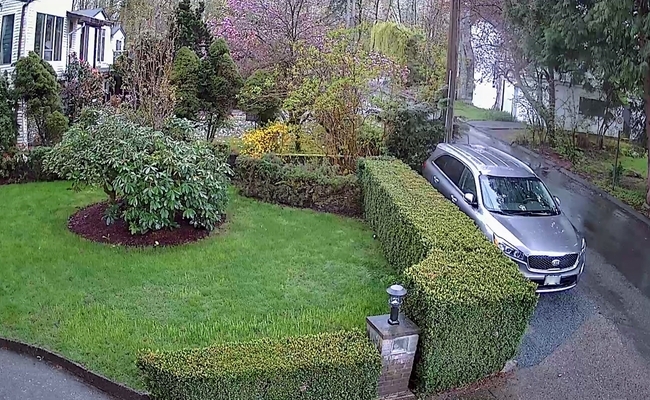 A right security camera will save you tons of trouble when you want to hide it. And Reolink Argus 2 is a good try if you want high quality surveillance as well as flexibility in making it invisible. Tired of traveling a long way to find a quality hidden security camera at Walmart? The Reolink Argus 2 is available in the security camera online store with free shipping worldwide including US, UK, Canada, Australia, Germany, NZ, etc. This entry was posted in Expert Safety Tips and tagged camera placement, disguise cameras, hide cameras. Amanda, Greetings. Can you tell me what pieces of PVC were used to mount and conceal the REO link Argus 2 camera in the ground mount as shown in Tip 1? What piece is that with the round “window” for the camera?